It’s supposed to make you feel good, not guilt-ridden, obsessed, or stressed. Here’s how to rewire your thinking about exercise, so that you can work it into your life successfully and in a manner that you can actually sustain. • You don’t have to exercise every day. In fact, don’t. As soon as you tell yourself you have to do this, you will start obsessing. Knowing exercise doesn’t have to be a daily thing is a huge relief to people. I don’t exercise every day, and although I could be fitter, I’m still pretty fit and I finally have a healthy relationship with exercise because I never force it on myself. • Exercise when you get the opportunity. There are so many opportunities in life to get out and move in a fun way. Take your kid for a walk. Take a break from your desk and do some jumping jacks. Walk to lunch. Walk to work. Take the stairs. If I’m on vacation at a beach, I will walk for an hour on that beach every day because I love doing that. But if I’m in New York and I’m in meetings or with Bryn all day, my formal workouts might be down to two or three days a week. Just be alert for it. Do tricep exercises on the coffee table when you watch TV. Do a yoga pose to unwind after a stressful phone call. Get down on the floor and stretch or do a few push-ups if you think of it. • Exercise changes with your life stage. Before I was pregnant and a mother, I exercised probably three to four days a week. I liked yoga in particular. When I was pregnant, I couldn’t do as much. I did a yoga video maybe twice a week and walked around the city. When I was on bed rest for two weeks, I couldn’t exercise at all. After I first had Bryn, I mainly focused on eating well. Maybe twice a week I’d get on the elliptical trainer, but it took me some time to feel ready to exercise again. Now I get it in two to three days a week maximum, on average, with occasional spurts of more. Your exercise needs and abilities and opportunities will evolve throughout your life, so just go with it. If you’re in your early twenties, get exercise ingrained into your muscles so you can come back to it. If you’ve got PMS, exercise more if it helps, or less if you just don’t want to move. Pregnancy, new motherhood, even menopause—they all affect how exercise will fit into your life, and that’s natural. • Stretching counts. Sometimes, the thought of an actual workout is just too much, but if you get up and stretch your muscles and do some light yoga poses that feel good, that’s better than doing nothing. It might make you feel so much better that you want to do more tomorrow. The more you start to relax and feel good, the more you’ll be ready to move and explore and enjoy yourself. • There are good reasons to increase your amount or intensity of exercise. If you want to get in shape for an upcoming vacation or some other special event, then you might want to start exercising more so you will look and feel your best when the event happens. Exercise will make you look more toned and feel stronger and more energetic. If you’ve been feeling in a funk lately, maybe you need to exercise more, because it boosts your mood and makes you feel better about yourself. Some days, the weather is great and you’ll feel better if you get outside and move. Fresh air just feels better if you’re breathing it in as you exercise. People get all worked up about what they should wear when they exercise. If buying a new gym wardrobe will actually make you feel better and more motivated about exercise, then by all means, do it. If you want the latest sweat-wicking technology or heart monitor or sports bra, why not? Personally, I wear a tank top with a built-in bra over a sports bra and workout pants I’ve had for five years or I just work out in my pajamas. I’m not one of those people who wants to spend a lot of money on workout clothes. I won’t judge you if you are. All that really matters is getting out there and doing it. • There are good reasons to decrease your amount or intensity of exercise. Sometimes you need to slow down. Sometimes you’re better off sleeping or deep-breathing. Know yourself, and you’ll be able to sense when you need to do less and when you just need to relax a little more. If you’re cleansing, you’re getting over a cold or injury, or you didn’t get enough sleep, take it easier on your body and focus on something like meditation or just resting. It’s okay to take time off. • Sleep is more important than exercise. I prioritize sleep over exercise. That doesn’t mean I won’t exercise if I’m a little bit tired, but instead of cutting my sleep short to wake up early and exercise, I’d rather take a walk two nights a week after work and then do something on the weekends after I wake up naturally. I love exercise, but I’m not going to lose sleep over it. Sleep is my ultimate goal. If I had a genie in a bottle, one of my wishes would be to get a good solid eight hours of sleep. • Be flexible about exercise. Exercise can be anything, anytime. Don’t get stuck on the idea that you can only exercise in a certain place or at a certain time of day. If you have it in your head that you are a “morning exercise person” and you miss a morning workout, you might feel like you can’t possibly exercise in the afternoon. Be flexible and fit it in as your day and life permit. • Keep changing what you do. For me, switching it up makes all the difference. Bodies react better to change, and I get bored doing the same thing every day. If you don’t want to get stuck in an exercise rut, try to do something different every day, but don’t worry so much about what it is. It doesn’t have to look like exercise. Pick what sounds fun or what you feel like doing. Some days, when the weather is nice, you might want to go outside and walk or run or ride your bicycle or just play with your kids. Other days, walk to dinner or go dancing with your girlfriends. It all counts. • Let exercise make you happier. Notice how exercise makes you feel when you do it in moderation. Have you ever seen those people who sweat through an hour of Bikram yoga, then do a spin class, and then lift weights? They look weathered and intense and obsessed. They don’t look very happy to me. I’m sure there are exceptions, but in general, moderate exercise boosts your mood and overly intense exercise stresses you out. Bethenny Frankel, four-time New York Times bestselling author, on-the-go working mom, self-made businesswoman, and daytime’s newest talk show host, shares her Skinnygirl guide to life: simple ideas, extraordinary results. Bethenny Frankel is the “mommy mogul [that] manages to do it all” (US Weekly), and in Skinnygirl Solutions, she shows you how to have it all without getting overwhelmed. As the New York Daily News raved, this is “a compendium of advice for the modern woman on how to live right, from the personal to the professional. Written in Bethenny-style, it offers tips that Martha Stewart would never think to share.” Bethenny’s no-nonsense hard-won advice extends beyond the first adult steps and well into real relationships, established careers, and mommyhood. 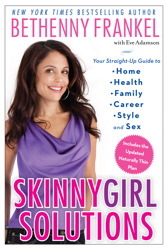 Covering every aspect of her non-stop schedule, Skinnygirl Solutions answers long-standing fans’ most-asked questions, while serving as the perfect starting point for the whole new generation of fans of her new talk show, who want advice on how to emulate her all-around success and balanced life.